Surprisingly, the marble rocks in the parks contain caves. 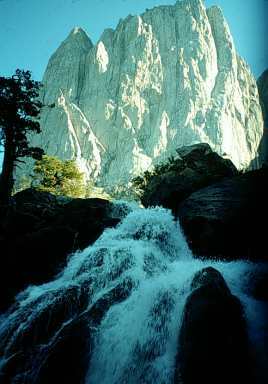 Marble is metamorphosed limestone and Sequoia and Kings Canyon together contain more than 200 marble caves. Caves form only under special conditions including the right kind of rock, fractures or spaces in the rock and enough water to erode underground rooms and passages. The caves of the two parks include the longest cave in California, Lilburn Cave, with nearly 17 miles of surveyed passage. Lilburn is a very complex maze cave with beautiful blue- and white-banded marble. Nearby mines attest to the unusual geology in the Lilburn area and the cave has displays of rare and colorful minerals including green malachite and blue azurite. Beautiful Crystal Cave features a trail and lights for park visitors. This commercialized cave has seen millions of visitors since it first opened to the public in 1941. It has beautifully banded marble, many cave formations, large rooms, and the creative Spider Web Gate. Soldier's Cave has been a favorite with California cave explorers since its discovery in 1949. Three rope drops must be negotiated to reach the cave's lowest and most extensive level. Several outstanding formation areas exist, one of which has high quality "dog-tooth spar" crystals. This cave has suffered due to inadvertent damage by cave explorers. People have accidentally broken cave formations and muddied extensive areas of white flowstone. Soldiers Cave was the site of a restoration and cleaning project between 1992 and 1997.